2. Marinate the prawns with ginger, garlic and Maggi seasoning cube. Fry the shrimps golden brown and let them cool down. 3. Soak the noodles gently in hot water, drain and leave alone. 4. Well-rinse the bean sprouts. 1. Bring the Hoisin sauce, Wippy Hot Peanut Butter, pepper and 2 tablespoons of water in a small pan to the boil while stirring. Let the mixture thicken until it has the same thickness as ketchup. Remove from the heat, sprinkle with chopped spring onions and let it cool down. 2. Chop the cucumber, omelet and carrot to the size of matchsticks and place on a plate with the bean sprouts and coriander. 1. Let the rice sheets soak one after the other in a flat dish with lukewarm water (not hot) for 10 to 40 seconds or until they are soft, but not TOO soft. Leave the sheets separately on a plate to be able to top them later. 2. 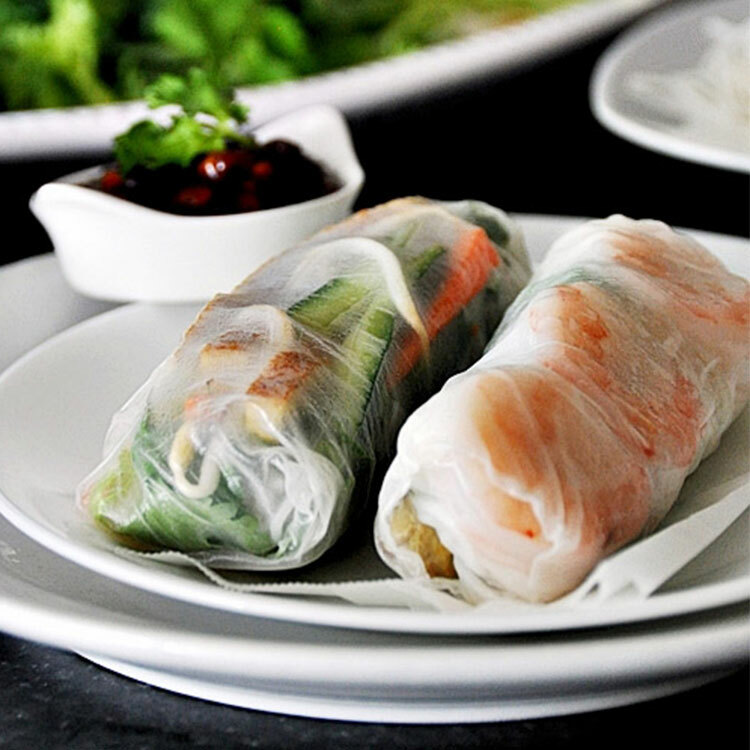 Top the rice sheets with a shrimp, egg and raw vegetables and leave about one cm free from the edge. 4. While you hold it all firmly together, you can tug the sides in and keep on rolling until the roll is closed.